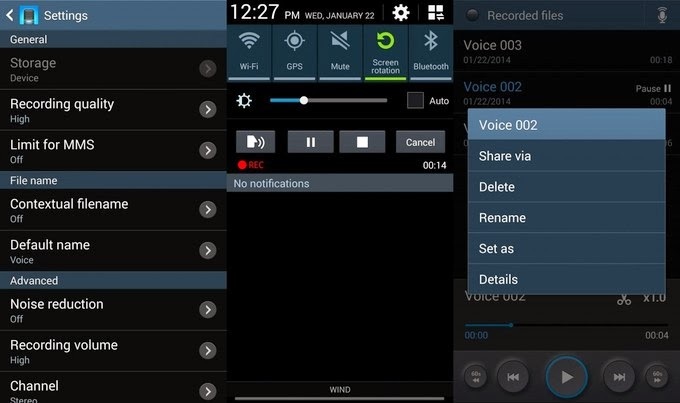 Voice recording on the Samsung Galaxy S4 is really simple and useful. 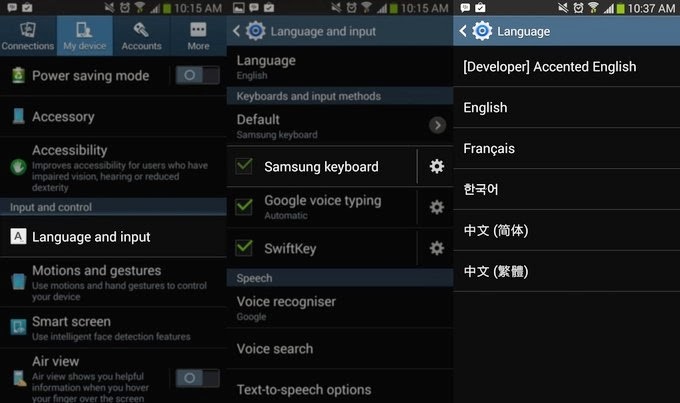 Taking a voice note on your Samsung Galaxy S4 is really easy. The built in Voice Recorder, though simple, packs all of the options and tools you need for capturing audio. Tap the record button at the bottom in the middle. Tap pause to delay recording, then the record button again to continue recording to the same file. Tap the square stop button to finish recording. Completed audio files are stored in an .m4a format under /storage/emulated/0/Sounds in the file system, though you can access them directly from the Voice Recorder app to share wherever you like. Just tap the arrow in the bottom-right to see saved voice notes, and tap each file name to listen (at increased or reduced speed if you like). You can also trim audio files from the playback section at the bottom of the screen. A long press on the recording name will bring up management options such as file renaming, sharing, deletion, and setting as ringtone. There are a bunch of helpful settings you can tweak too. Tap the menu key and hit Settings. 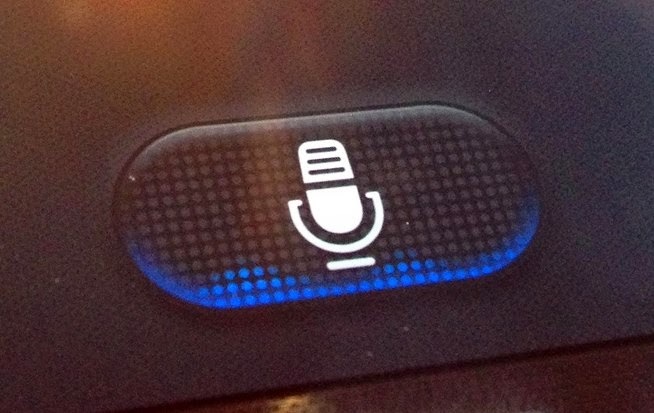 From there you can toggle GPS-based filenames and change recording quality and volume. 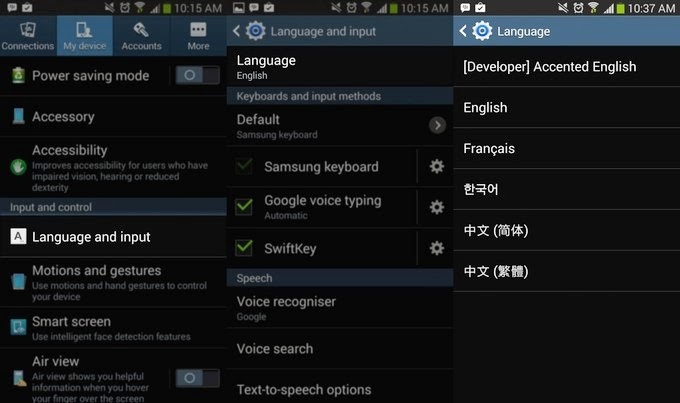 Alternatively, you can store voice notes alongside written ones in the S Notes application. 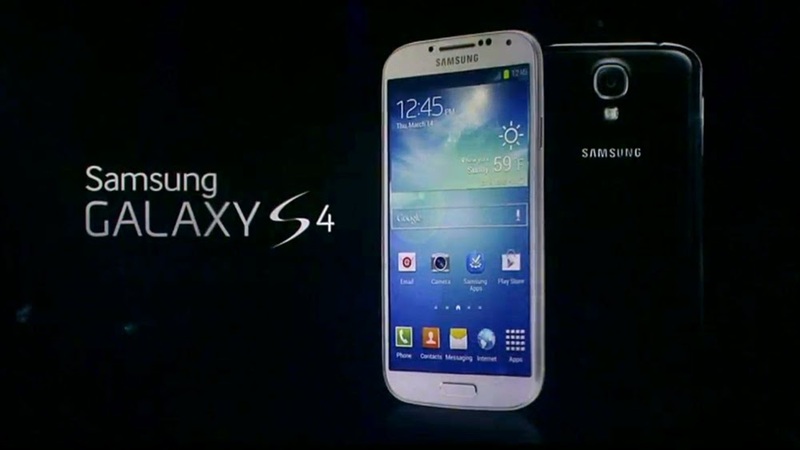 Does your Samsung Galaxy S4 not have enough juice to make it through the day? Well, we've got some tips to make sure you get the very most out of that battery. 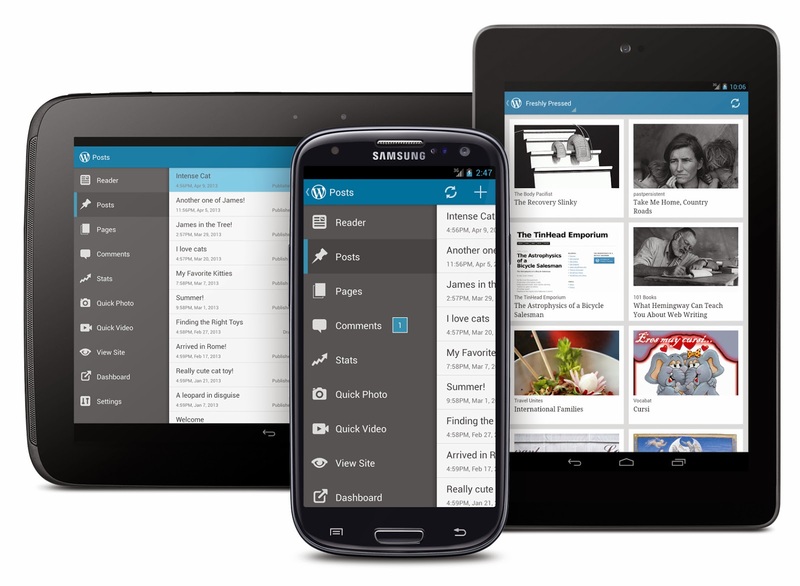 Managing background apps, wireless activity, and display are all big parts of the picture. A lot of it is straight-up common sense, but it's very easy to forget to do a lot of the basics. 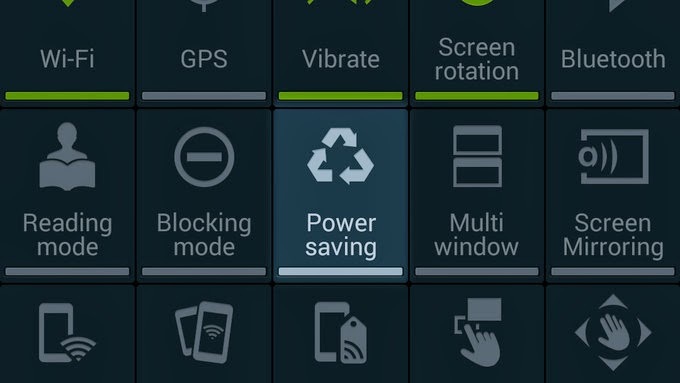 Power Saving mode conveniently throttles processor usage, screen brightness, and disables vibration all at once to save on battery life. Vibration is a big one; be sure to have your notifications set to mute or audible instead by using the volume keys. Swipe down from the top of the home screen to bring up the notification pane. Tap the icon in the top-right to see all options. 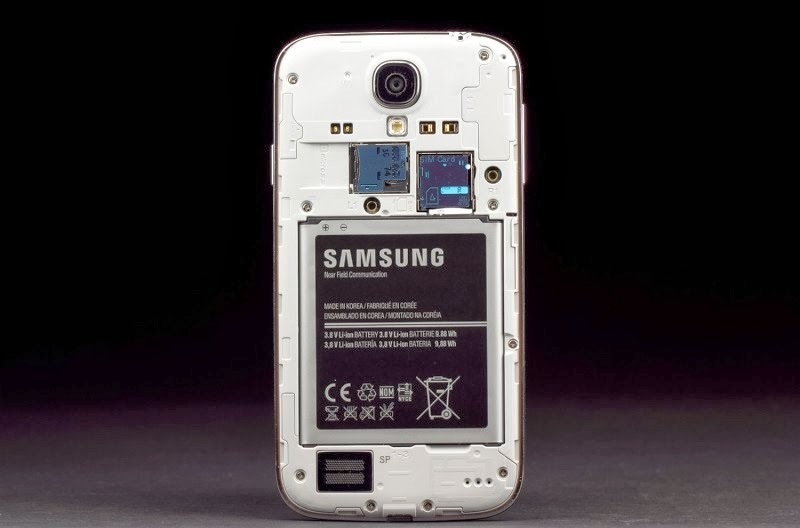 The display on the Samsung Galaxy S4 is generally the biggest drain on battery life. Reducing the brightness of the screen can earn you some precious time, but will reduce visibility outdoors. 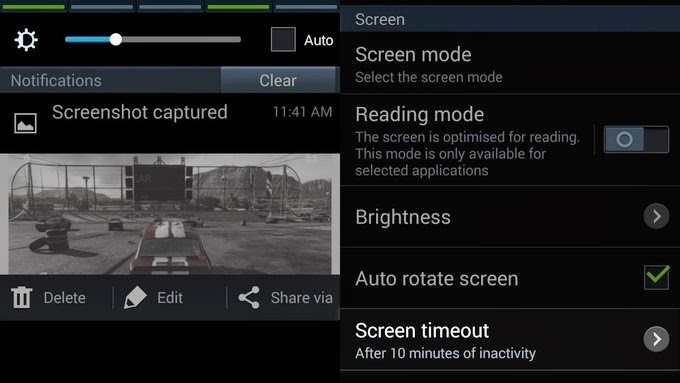 Setting a shorter timeout duration will ensure that the screen isn’t active for any longer than it absolutely needs to be, though it may turn off too quickly for your preferences. Drag the brightness slider near the top towards the left. Tap the gear icon at the top, the My Device tab at the top, then Display. Tap Screen timeout and set how long before the screen turns off on its own. It’s easy to forget that some wireless functions are continually on in the background not doing much of anything. Turn them off when not in use. Just remember that if you’re within Wi-Fi hotspot range most of the day, you’ll actually save power using it instead of cellular data. 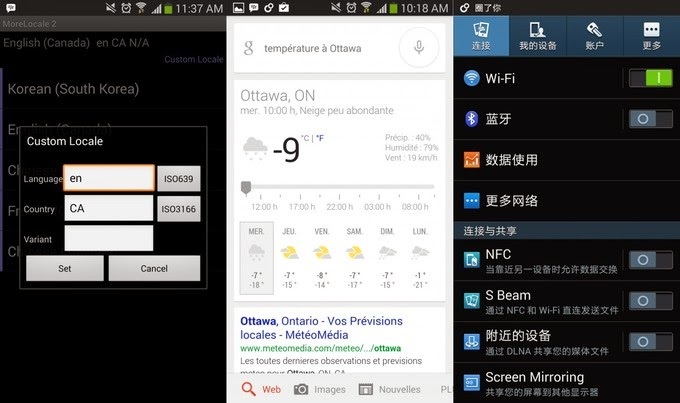 Tap NFC, Wi-Fi, Bluetooth, GPS, and Mobile Hotspot so the icons are greyed out. 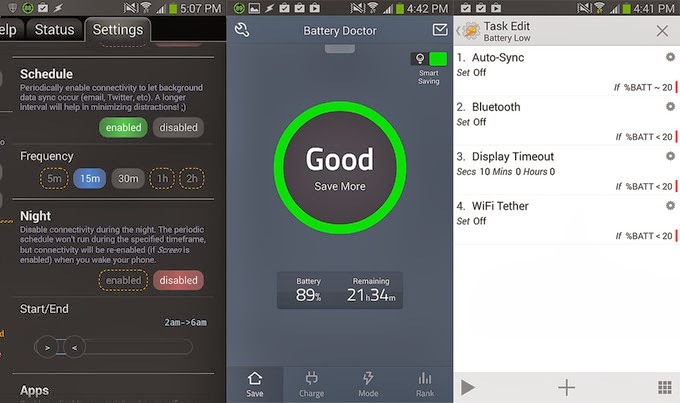 Other extraneous functions, such as Air view and screen mirroring can also be disabled here to save on battery. 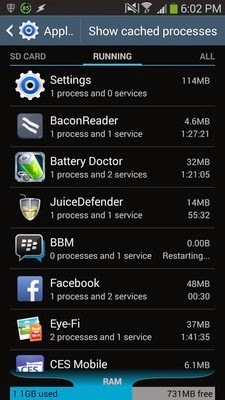 Sync in particular can be a major battery drain. Though turn off sync from the notification tray means certain apps won’t notify as quickly as you like, it will certainly save you some battery life. 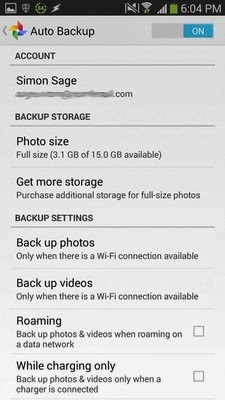 Google+ can be a key offender here, but also other cloud apps, like Dropbox, that are set to back up photos as you shoot them. Be sure to dive into your various apps and individually disable auto-uploads and sync on any that aren’t vitally important. Tap Sync so the icon is greyed out. Home screen widgets and active wallpapers are notorious battery hogs since they’re basically active all the time. Give them the axe. You never really needed them anyway, right? Long press on a home screen widget. Drag it to the trash can at the top of the screen, and release. Long press on the home screen background and tap Set wallpaper from the pop-up. Tap Home screen and pick a wallpaper source other than Live wallpapers. Select an image, crop appropriately, and tap Done in the top-right. Apps can run in the background and use up precious CPU cycles when you’re not actively using them. Most of them show up in the multitasking view and can be closed safely from there. While some need to be manually closed down, it's not always advisable. 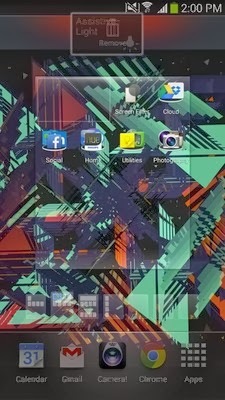 Force closing and disabling background apps may cause instability, depending on how vital they are. Be sure to read up here on how your phone already does a pretty good job of handling memory management before going on a task killing spree. 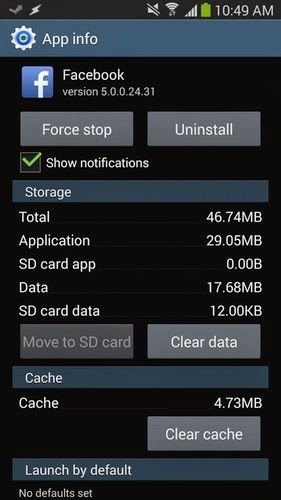 In any case, drilling into your system settings can at least show the most active (and power-hungry) apps on your Samsung Galaxy S4. In most instances uninstalling these apps will be better than just killing them, since they'll often restart on their own. Hold down the home button to summon the multitasking view. Tap the icon in the bottom-right to close all active apps. Tap the gear icon at the top, the More tab at the top, then Application manager. Swipe to the left until you're on the Running tab. Tap Show cached processes at the top to see background apps. 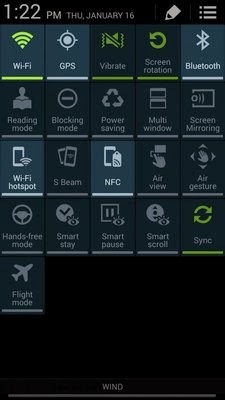 Tap apps and select Stop to stop currently running processes. Many of the tasks outlined above can be performed automatically (or at least aided) by high quality apps in Google Play. With them, you can control which apps launch when, which apps are hogging precious resources, and automatically toggle certain functions under specific conditions. Here are just a few suggestions to get you started. If you need added assurance that your Samsung Galaxy S4 will make it through the day, extended battery packs are available. These will add thickness to your device, but it may be a necessary evil to keep your phone active for as long as possible. You can also grab a standard stock battery to swap out as needed. Flappy Bird is the hottest game on the Play Store - at least for the moment - and topmost on every gamer's mind is how to get a higher score than their friends without smashing their phone to pieces in the process. Flapp Bird is a fantastically terrible game, its design is derivative, its mechanics maddening, and its popularity no doubt the result of incredible rage-of-mouth marketing. Yet despite all of that (or maybe because of it), we can't. Stop. Playing. So how can you get better at Flappy Bird faster? For some games it's simply a matter of finding the right tips, hints, and cheats. Flappy Bird, however, is so simple, that there are few to no ways to hack the system. But that doesn't mean you can't hack yourself. Though Flappy Bird is entirely playable on an Android phone, it's much easier if you play on a tablet. Not only are your hands less cramped, but you'll have an easier time discerning details, and less of a chance your own finger will obscure your view and get in your way. Not to mention, you can soak in all of the glorious 16-bit-style art on a tablet. If you are playing Flappy Bird on an Android phone, pick a smart place to tap and stick with it. The corners where the ground scrolls by is a good spot and won't get in the way of oncoming pipes. This is particularly important if you're tapping with your right hand, since that's the edge where the pipes fly in from. You may find you have even more control with a stylus. Don't let an errant phone call ruin a good run. Any notification can send your stupid little bird face-first into the ground. Go ahead and mute notification sounds before you start to play. 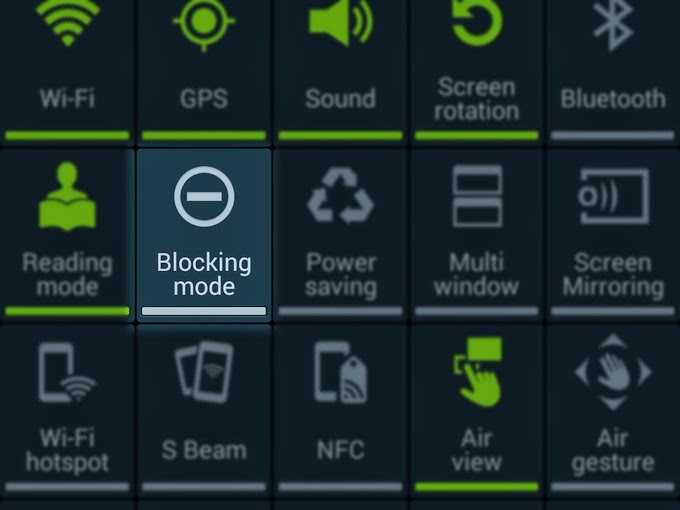 If you have a Samsung device, you can turn on Blocking mode. Make sure to get the timing for your taps down pat. 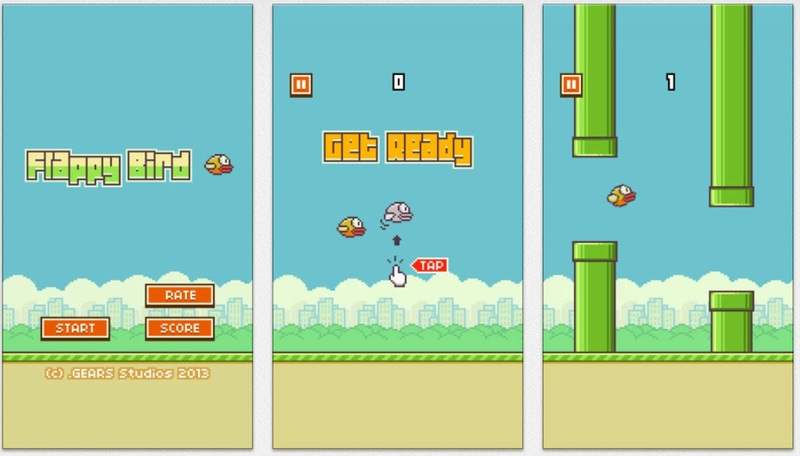 The whole point of the game is to get the bird through the pipes without touching them, which means you have to learn to keep it as level as possible. Since the bird is always coming up or going down, you need to time your taps so that those peaks and dips are as consistent as possible and short enough to fit through the gaps. Recover your rhythm quickly after you rise or fall to the right height for the pipe by double-tapping or pausing to drop, then getting stable again really fast. This will take plenty of practice, so keep at it. Flappy Bird is an easy game to get angry at. You'll be failing often, and as silly as it may be, you're going to get stressed out about it, and that can affect your performance. Luckily, the same stress-reducing techniques that are commonplace outside of these games works just as well when trying to stay focused. Slow, steady, breathing actually works wonders. It sounds silly, but it creates calm and focus. When you start getting close to your high score - or your friend's high score - you'll be less likely to freak out and fly right into a pipe. Can’t stop Facebook notifications from groups, events, posts, or events on your Samsung Galaxy S4? We can help. 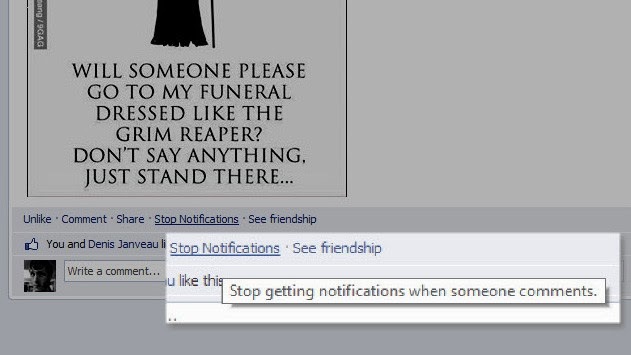 If you have particularly active friends on Facebook, you’ll know what it’s like to get a ton of notifications on your phone that you aren’t necessarily interested in. 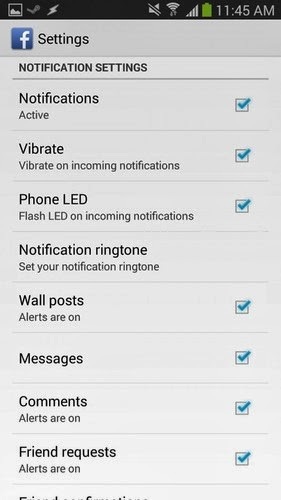 There are a number of ways to turn off notifications from Facebook on the Samsung Galaxy S4, depending on which you still want to get through. Sometimes this is done through the phone and app, and other times it involves you changing options on Facebook’s website. 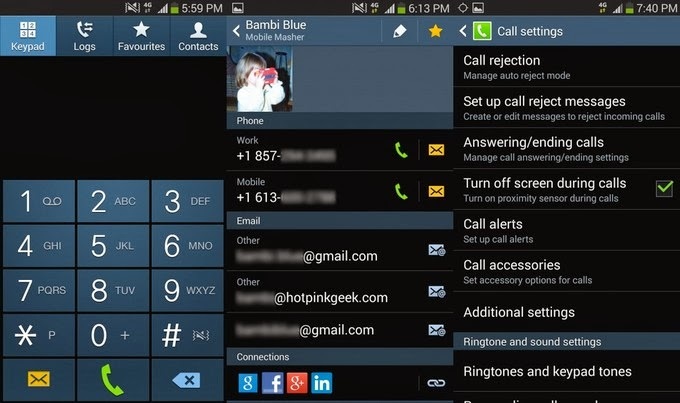 This will hide Facebook notifications from showing up in the notification tray of your Samsung Galaxy S4, though they’ll still be left unread on your account when checked manually from the app. Uncheck the box that reads Show Notifications. 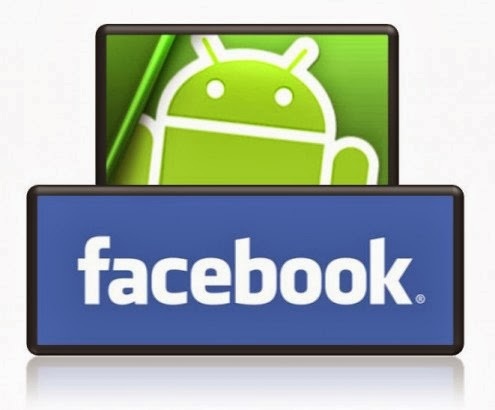 The Facebook app for Android lets you pick and choose which notification types will show up on the device. This includes Wall posts, messages, comments, friend requests, friend confirmations, photo tags, event invites, nearby friend alerts, application requests, and group alerts. If there’s just one post that you don’t want to get notifications from, you can turn them off on a case-by-case basis. Go to Facebook.com in a browser on your computer. Go to the conversation you want to mute - odds are you’ll be able to find it by clicking the globe icon at the top of the screen to view your recent notifications. Click Stop Notifications beneath the post you want to mute. It will be in a row of other options, such as Share, See Friendship, and Comment. Further notifications can be changed from Facebook’s website. Click the settings gear icon in the top-right, click Account Settings, then, click Notifications in the pane on the left. From there you have plenty of control over notifications. Flappy Bird is a ridiculously simple, mind-numbing, intelligence-sapping game that feeds off your boredom and pumps thousands of dollars into the hands of the sole developer through advertising. Flappy Bird has become ridiculously popular in the past weeks, amassing between 10 million and 50 million total installations on Android. Flappy Bird is available on iOS. It's eventually headed to Windows Phone. And now, we're going to show you how to win at Flappy Bird. Some of these Flappy Bird tips and tricks will be stupidly self-explanatory. Some of them may make you laugh. Others may make you cry. (Lord knows they've made us curse a time or two.) So here goes. Here's how to beat Flappy Bird, insofar as you're able to win at a game that has no end, no purpose, and even less importance in the overall state of society. This should be pretty self-explanatory. 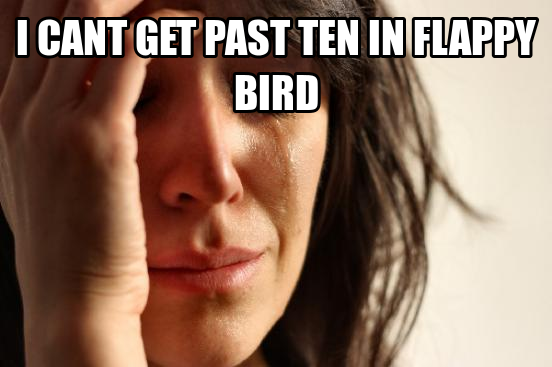 But if you're new to Flappy Bird, don't overthink it. You touch the screen to make the bird flap. Don't let it touch the pipes. If you touch the pipes, you'll die. You'll lose. And then you'll have to start playing all over again. And that's no way to beat Flappy Bird. We recommend laying off the booze for at least 15 minutes before playing Flappy Bird. That will ensure the optimal nerve response time from your fingers to your brain, and vice-versa. You need those synapses firing on all cliched cylinders. So take one for the team and lay off the sauce. You might also consider abstaining from any other, intensive movements that might strain your flapping hand. 3. Want to beat Flappy Bird? Get comfortable! When it comes to flapping birds, bigger may well be better. We're talking about screen size, of course. Sure, you can play on a 5-inch device, and for most people, 5 inches is enough. But some need to take in more. Pixels. For that, we recommend switching over to a tablet. Flapping with 5 inches is fine. Flapping with 7 or 8 tends to be ideal for most folks, according to a recent information survey conducted by a major Android blog. Some folks prefer 10 or 12 inches for flapping, but for many it's just too much. 4. Eliminate distractions. All of them, if possible. Flappy Bird requires the utmost concentration. A single distraction can cause disaster when it comes to beating Flappy Bird. So we recommend eliminating any and all distractions. If possible, lock yourself in a secluded room. (Double-locks are best.) At the very least, pop in some headphones, cover your top half with a blanket or towel, and start flapping. 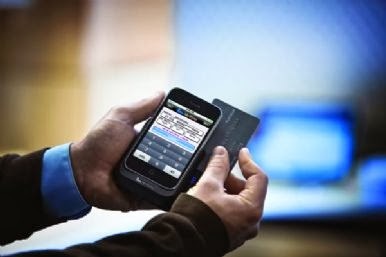 An iPhone is a strong tool to assist you manage your business whereas on the go. Its skillfulness and movableness will assist you keep connected and productive through the tip of the workday, despite wherever you're. however business users beware: a similar options that create your iPhone thus helpful additionally open you up to a litany of security risks. 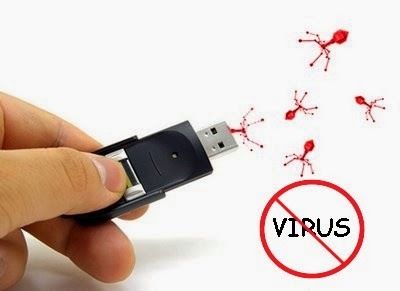 Smartphone security is not any joke, particularly if you handle sensitive company knowledge or shopper data. each iPhone business user ought to take a couple of basic security measures, like setting a lock screen PIN — that's, unless you own a brand new fingerprint-sensing iPhone 5S. however you should not stop there. Here square measure 5 easy-to-use apps you'll be able to install to create your iPhone safer. The new iPhone app Confide, that has been referred to as "Snapchat for business," offers associate innovative means for business users to firmly send and receive short messages. to stay your messages personal, Confide will 2 things: initial, just like the in style picture-messaging app Snapchat, Confide messages square measure deleted mechanically when they're browse. Second, the text of every Confide message is at the start blocked out. To browse a message, users have to be compelled to swipe over its text to reveal a couple of words at a time. This feature prevents anyone from taking a screenshot of the complete message. causation a confidential business message with Confide is as painless as causation a daily SMS text message, and it's rather more secure. Think of SplashID as a secure locker on your iPhone wherever you'll be able to store any sensitive knowledge you would like. Once you access the app employing a secure master parole, you'll be able to read and edit confidential records. SplashID offers a worry-free thanks to store usernames, passwords, mastercard knowledge, account numbers, registration codes or the other sensitive business data on your iPhone. you'll be able to keep your knowledge organized in customizable classes and access your most-viewed files quickly. Like different knowledge security apps, it mechanically backs up your files to the cloud.